How to Improve the Clarity of LED Display? People pay wide attention on LED displays since their come to being. With the continuous advancement of installation technology in recent years, they are have approved by various industry sectors. Led display production and maintenance also requires professional knowledge, how to make high-definition LED display? To achieve high-definition display must have four factors: First, the film source requires full HD; Second, the LED display requirements can support full HD; Third is to reduce the pixel pitch of the LED display; the fourth is the combination of the led display and the video processor. At present, LED full color display is also moving towards higher definition display. Contrast is one of the key factors affecting visual effects. Generally speaking, the higher the contrast, the clearer and more conspicuous the image, and the more vivid the color. High contrast is very helpful for image sharpness, detail performance, and gray level performance. In some text and video displays with large contrasts in black and white, high-contrast full color LED displays have advantages in black-and-white contrast, sharpness, and integrity. Contrast has a greater impact on the dynamic video display. Because the light and dark transitions in the dynamic image are faster, the higher the contrast, the easier it is for the human eye to distinguish such a conversion process. In fact, the contrast improvement of LED full color screen is mainly to improve the brightness of the full color LED display and reduce the surface reflectivity of the LED screen. However, the brightness is not higher, the better,but too high brightness will be counterproductive , not only affecting life expectancy of the led display, can also cause light pollution. Light pollution has become a hot topic now, and excessive brightness will have an impact on the environment and people.The full color LED display LED panel and LED lighting tube are specially processed to reduce the reflectivity of the LED panel and also improve the contrast of the full color LED display. The gray level refers to the brightness level that can be distinguished from the darkest to the brightest in the brightness of the single color of the LED full color screen. The higher the gray level of the full color LED display, the richer the color, the more vivid the color; Otherwise,the display color is single and the change is simple. The increase of the gray level can greatly increase the color depth, so that the display level of the image color increases geometrically. The LED gray level control level is 14bit~16bit, which makes the image level resolution details and display effects of high-end display products reach the world advanced level. With the development of hardware technology, LED gray levels will continue to develop toward higher control precision. Reducing the dot pitch of the LED full color display can improve its sharpness. The smaller the dot pitch of the full color LED display, the finer the screen display. 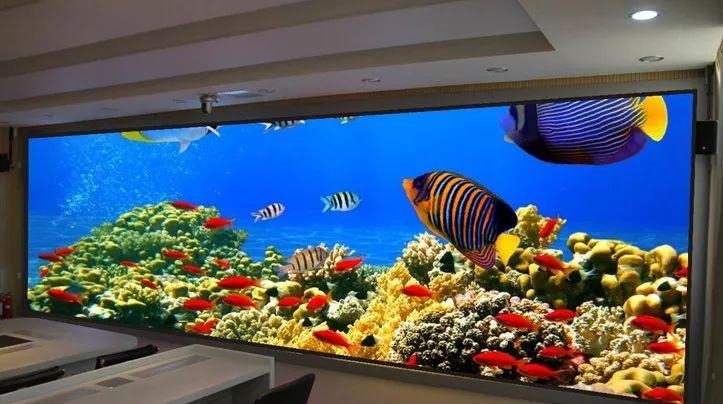 However, this point must have mature technology as the core support, the input cost is relatively large, and the price of the full color LED display produced is also high, but fortunately the market is now moving toward the small pitch led display development. The LED video processor can use advanced algorithms to modify the signal with poor image quality, perform deinterlacing,edge sharpening, motion compensation and other processing to enhance the details of the image and improve the picture quality. The video processor image scaling processing algorithm is used to ensure that the video image is scaled and processed to maximize the sharpness and gray level of the image. In addition, the video processor is also required to have rich image adjustment options and adjustment effects to process image brightness, contrast, and grayscale to ensure a soft and clear screen output.